Rich Scangarello on the 49ers sideline. The Denver Broncos’ offensive staff is nearly complete. Head coach Vic Fangio first hired offensive line coach Mike Munchak from the Pittsburgh Steelers and according to multiple reports, the Broncos have finalized a deal to make Rich Scangarello the team’s offensive coordinator. Broncos officially hired former 49ers’ QB Rich Scangarello as their offensive coordinator, per source. Scangarello will be Denver’s play caller. Over the last three seasons, the highest a Denver offense has ranked is 22nd in the league, which is a big reason the Broncos have not made the postseason since 2015. Munchak will be tasked with helping the offensive line become more consistent. Scangarello will likely be in charge of helping the Broncos find the quarterback of the future. Scangarello has spent the last two seasons as the 49ers quarterback coach, where he had success working with rookie quarterback C.J. Beathard in 2017. Beathard set the single-season franchise record for attempts (224), completions (123) and passing yards (1,430) by a rookie quarterback, before the 49ers acquired Jimmy Garoppolo from the Patriots. Working with Scangarello and 49ers head coach Kyle Shanahan, Garoppolo then became the first quarterback since the NFL merger 1970 to win each of his first five starts with a new team. Garoppolo also set a franchise record for the most passing yards in his first five starts with the 49ers (1,542). Finally, when Garoppolo went down with an ACL injury and missed the majority of the 2018 season, San Francisco had to adjust and roll with rookie QB Nick Mullens. In eight starts, Mullens completed 64.2 percent of his passes and threw for 2,277 yards while guiding the 49ers to a 3-5 record. 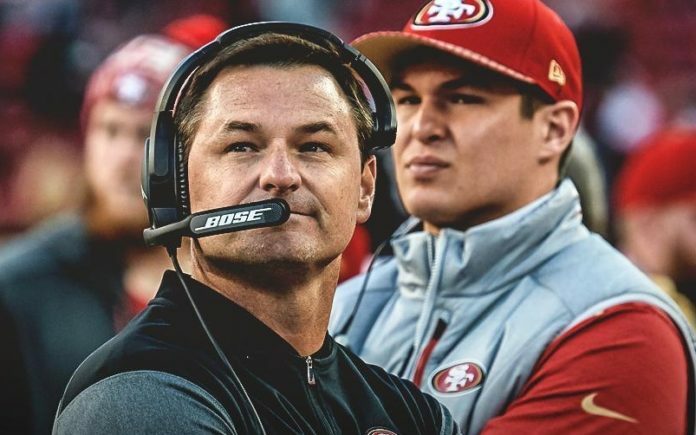 In December, Mullens credited Scangarello for bringing him to the Bay after the 49ers defeated the Broncos at home. “Coach Scangarello, he pretty much found me,” Mullens said. “I was at East-West Shrine game in [St. Petersburg, Florida] and I guess he liked the things that I did in that game and in those practices. And then he followed up with me with a phone call after that. The Broncos will hope Scangarello can have similar success with finding a young quarterback in Denver. John Elway openly called Case Keenum a short-term fix at quarterback and with a top 10 pick, the Broncos may be considering prospects like Missouri’s Drew Lock or Oklahoma’s Kyler Murray.